The interview process is not a one-way street of candidates applying - both your company and the candidate have to put its best foot forward in today's competitive job market. According to research from Ideal, 46% of candidates would sever a relationship with an organization who had a negative experience. But what factors matter most when designing an optimal candidate experience? It’s the strongest job market in a generation, which means it’s harder than ever to attract top talent. Join Glassdoor Chief Economist, Andrew Chamberlain, Ph.D., as he breaks down the data on why hiring in today's economic landscape is so difficult and how prioritizing positive culture can give you a competitive edge. Talent leaders from top Best Places to Work winners will engage in a conversation around the importance – in both small and large companies – of having women in leadership. 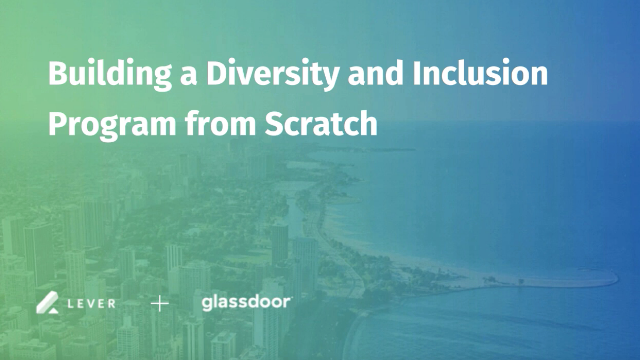 Led by Glassdoor’s Amy Elisa Jackson, panelists will cover how they effectively minimize hiring bias, elevate the candidate experience, and shape their employer brand on Glassdoor to challenge the expectation for a mostly male executive team and bring on the very best talent. Two top companies on the Best Places to Work list this year have vastly different businesses, but they have one thing in common: they’ve implemented some unique strategies to gain significant competitive advantage. In this session, they’ll divulge some of the out-of-the box approaches they use, and how you too can leverage them to be both superior to and different from your competitors. Christian Sutherland-Wong sits down to chat with Madan Nagaldinne, Chief People Officer of Compass, about how to truly engage your people, the impact of actively promoting the spirit of entrepreneurialism within your company, and widespread shifts that are shaping the future of the workplace. Join this Glassdoor webinar to learn the most effective strategies for quickly finding the right people for your toughest roles. When it comes to hiring and retention, your employer brand is huge. It’s your company’s value proposition combined with overall reputation that prospective and current employees use to evaluate whether or not your company is the right place to work. Employers need to meet high expectations and find innovative ways to communicate their culture to these audiences. In this panel webinar, HR leaders from Glassdoor, Sapling, Rapid7, and Culture Amp, will discuss how to leverage your employer brand to attract and retain top talent. Expert panelists from high-performance, hyper-growth organizations will answer your questions and share their practical experience, starting with how to ensure that your company values act as a rallying force for each team member in your company. As many talent acquisition professionals know all too well, 2018 was a challenging year for hiring. So what will 2019 bring, and how can employers get ahead now? Find out from Glassdoor’s Chief Economist, Dr. Andrew Chamberlain, as he shares his predictions! In today's employment landscape, employers work harder to attract strong talent pools. It begins with a great first impression on job seekers and continues with a stellar candidate experience that improves talent pipelines. In this era of ceilings being broken and “culture adds” over “culture fits,” it’s never been more critical to weed out bias within your organization. And there’s quantifiable proof that it’s good for your culture, too. Two-thirds of job seekers say that a diverse workforce is an important factor when evaluating companies and job offers (1). Companies who recruit on Glassdoor see great results – like 30% greater retention rates1 and lower hiring costs.2 But how, exactly, do SMBs use Glassdoor to recruit? To find out, we sat down with recruiting leaders from Sprout Social, Cumulus Networks and Medical Guardian. Discover the top 5 takeaways from that discussion in this eBook. There has never been a bigger focus on branding and messaging in talent acquisition than right now. Why? Because people no longer want to work for a company – they choose instead to work with a company. Learn from top company leaders how to create, nurture and support company culture initiatives. Glassdoor is more than just the first place people go to find a job. Companies now check it out before deciding to do business with you. Even potential investors use Glassdoor before making their final decisions! That’s why a strong presence on Glassdoor is vital for your company. But don’t fear: this is all good news. Having a Glassdoor profile can help your company grow in all the right ways. Organizations that prioritize employer branding are 250% more likely to rate their overall talent acquisition efforts as highly effective! That’s an impressive stat, but how does it translate into dollars and cents? In other words: what is a strong employer brand really worth to your company? While employer branding may not be an exact science, you can still calculate values for each of the benefits and costs associated with your branding efforts. This webinar will show you how to build that business case for investing in your employer brand, vital metrics for measuring the success of your efforts, and insights into where to allocate your valuable resources. With a strong job market today, recruiting top talent is tougher and more competitive than ever. But recent research from leading analyst firm IDC suggests many companies are making big mistakes when it comes to their recruiting strategies and budgets. Could you be making them too? In this webinar, we’ll uncover the top recruiting mistakes employers are making. Plus, you’ll hear how to fix these mistakes to recruit talent more effectively, while getting smarter about how to use your budget. Gone are the days when a job description was simply a list of required skills and a summary of daily expectations. Now, to reach top candidates, job descriptions must actively sell a position that paints an authentic picture of the work. Having a solid employee engagement strategy can turn current employees into brand ambassadors, amplifying your recruitment efforts year-round. Studies show that happier, more content employees do better work, increase productivity and help recruit great talent to the organization. In fact, companies with employee engagement programs achieve 26% greater year-over-year increase in annual company revenue, compared those who do not have formal programs (Aberdeen, October 2015). Every company, of course, has unique challenges and attracts different talent to its workplace. That’s why your strategy to engage employees should be tailored to your company size, culture, products and services, and industry. Glassdoor is the world's most transparent jobs and recruiting marketplace that is changing how people search for jobs and how companies recruit top talent. Glassdoor combines free and anonymous reviews, ratings and salary content with job listings to help job seekers find the best jobs and address critical questions that come up during the job search, application, interview and negotiation phases of employment. For employers, Glassdoor offers recruiting and employer branding solutions to help attract high-quality candidates at a fraction of the cost of other channels.